The Campbell Inn offers both the business and leisure traveler a great option to Silicon Valley's big box hotels. Designed in the style of the adobes of old Monterey, the tree-shaded Campbell Inn sets adjacent to the Los Gatos Creek trail, where you can walk, jog or bike along its shimmering waters. Just across the way in the Pruneyard, one of California's most beautiful shopping and dining centers, you’ll find exclusive shops, distinctive restaurants, nightlife with intimate cocktail lounges, lively pubs and three theaters — all in an Old World Spanish setting. A courtyard pool and a deluxe whirlpool spa tucked neatly into a secluded alcove, private lighted tennis courts, complimentary bicycles and a guest fitness center are all yours to enjoy. Monday through Friday mornings, guests are served a lavish poolside breakfast buffet. And after a busy day, you'll enjoy the Campbell Inn's weekday evening social hour when wine and assorted cheese and crackers are served poolside in our cozy banquet room. 95 deluxe guestrooms illustrate the ultimate in luxury with elegantly appointed accommodations. All rooms have refrigerator, coffee maker, data Line/PC connection, electric hairdryer, remote color TV (HBO, ESPN, CNN), VCR, in-room movies, ironing board & iron, AM/FM radio/alarm clock. One and two bedroom suites have king size bed, Jacuzzi tubs, steam sauna and sitting parlors (with fireplaces available). 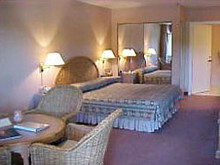 Deluxe rooms have king size bed & Jacuzzi tub, and double/double rooms with balconies are available. 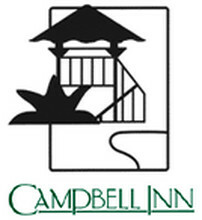 The Campbell Inn also offers free pass to fitness center, valet/laundry service, safe deposit boxes, vending/ice machines, non-smoking rooms, handicapped facilities and free parking.